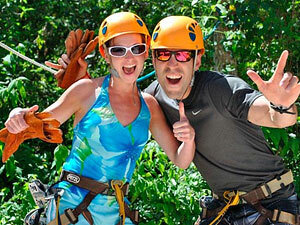 The name of Aktun Chen is formed by the Mayan words Aktun> (Cave) and Chen (Cenote). 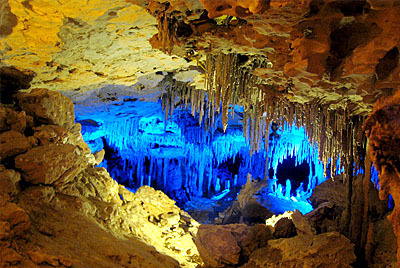 In this tour you will walk through a spectacular cave of over 5 million years old that features a great variety of stalactites, stalagmites and columns. The length of the cave is over 600 meters (0.37 mile) and is composed of magnificent vaults. You will also enjoy a beautiful cenote of crystal-clear water of 12 meters (39 feet) depth. Fly over a kilometer (0.62 mile) through 10 zip lines and two suspension bridges; contemplate tropical trees, plants and flowers. Refresh yourself and live the magical experience of swimming in a cenote (sinkhole) of crystal-clear water inside a cave of over five million years old, snorkeling through stalactites, stalagmites and columns. The park features a wildlife zoo in an area of 3 hectares (7.4 acres), where you can admire local flora and fauna. Altogether, the cenotes and caves that you will know are cataloged by National Geographic in the third place of the 10 best underground treks in the world. Cash for souvenirs, souvenirs, clothing, etc.